Call it a "crude awakening." Energy stocks plunged Friday after OPEC announced no cuts in production, a decision that sent oil prices crashing to their lowest levels since May 2010. Shares of Dow components Exxon Mobil (XOM) and Chevron (CVX) fell 4% and 5%, respectively. And they were among the better performers in the sector. Oil driller Transocean (RIG) plummeted 10%. 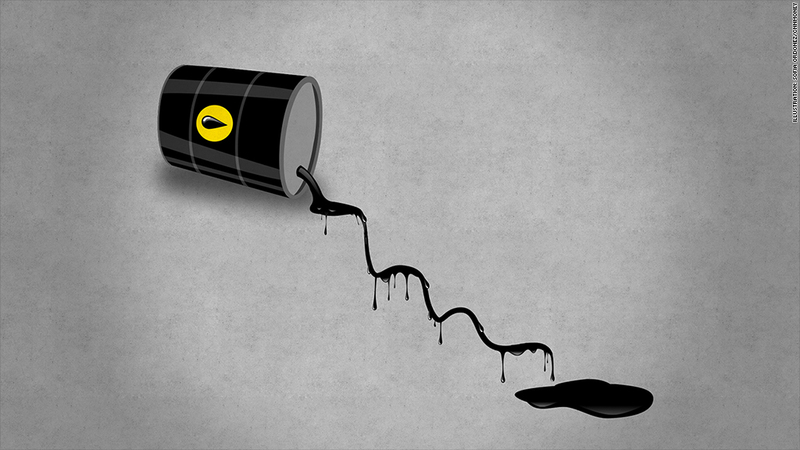 So did oil services giants Schlumberger (SLB) and Halliburton (HAL). Energy prices have been on a slip and slide ride for the past few months due to concerns about sluggish demand out of Europe and an economic slowdown in China. But the supply part of the equation is also a bit out of whack lately. The United States has boosted its output of oil thanks to the shale gas boom in North Dakota, Pennsylvania, Texas and other states. Oil stocks have plunged along with crude prices. It has been reported that Saudi Arabia and several other OPEC members in the Persian Gulf region were not in favor of oil production cuts partly because lower prices could make it tougher for U.S. energy companies to compete in the global market. Natural gas takes hit too: It should be no surprise that shares of several natural gas companies in the U.S. fell hard Friday too. Chesapeake Energy (CHK), EOG (EOG) and Devon Energy (DVN) were all down nearly 10%. Newfield Exploration (NFX) and Denbury Resources (DNR), the two worst performers in the S&P 500 Friday, dropped more than 15%. Continental Resources (CLR) tumbled 20%. If oil prices continue to slide, energy stocks are going to suffer for a prolonged period unless they take some dramatic steps. One driller, Norwegian-based SeaDrill (SDRL), announced Wednesday that it was halting its dividend payment to conserve cash. Shares plunged more than 23% on the news and several other drillers, including Transocean, Noble (NE), Ensco (ESV) and Diamond Offshore (DO) all fell sharply as well. Lower crude prices could also spark a wave of consolidation in the energy sector as companies seek to cut costs. 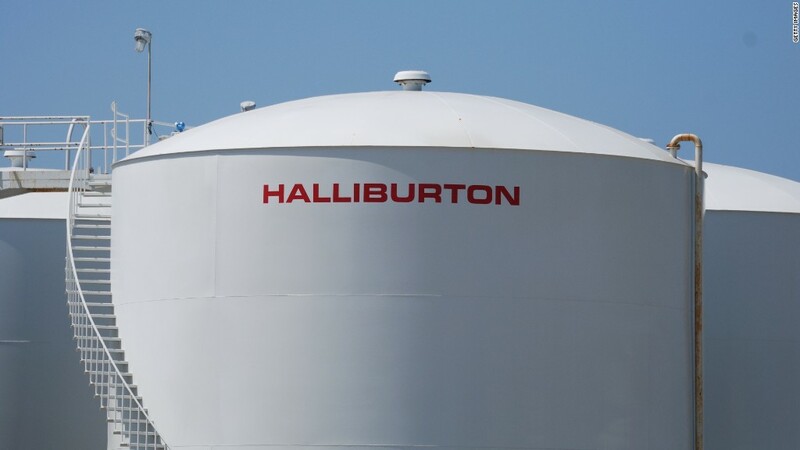 Halliburton has already agreed to buy rival Baker Hughes (BHI) for nearly $35 billion. Cheap gas is good for these stocks: Even though oil stocks were getting absolutely destroyed on Friday, the broader market continued to march higher. And it was led by two sectors that should benefit from the decline in energy prices ... at least temporarily. Airline stocks were soaring Friday. Southwest (LUV), which is the best performer in the S&P 500 this year, gained nearly 8%. Delta (DAL), JetBlue (JBLU), United Continental (UAL), American Airlines (AAL) and recently public Virgin America (VA) were also dramatically higher. The rationale is simple. Lower jet fuel prices should lead to bigger profits for the airlines. Retailers popped as well. With shoppers hitting the stores on Black Friday (and even on Thanksgiving) the hope is that consumers will feel more flush since they won't have to pay as much at the pump to refuel their cars. Shares of WalMart (WMT), Target (TGT), Best Buy (BBY) and Macy's (M) enjoyed a nice bump, as did online retail king Amazon (AMZN). Remember how low oil and gas prices got in 2008 and early 2009? Anyone want to go through another Great Recession again? Reader Comment of the Week. I tweeted a reference to one of my favorite movies this morning as oil prices and oil stocks were tanking. "There Will Be Blood 2: Electric Boogaloo. Oil stocks are getting shellacked #premarket. I don't drink your milkshake. $DO $RIG $XOM $CVX $BP"
For the record, the Daniel Day Lewis movie is my personal pick, not Breakin' 2. But one reader trumped my movie reference with another by "There Will Be Blood" director Paul Thomas Anderson. "Try some Punch Drunk Love instead $TAP $BREW $DEO," tweeted @t_aaron_brown. Nice! Even though "Punch Drunk Love" isn't about beer, I'll let it slide. An underrated movie. Sandler is pretty good. And I don't know about you, but I can't wait for "Inherent Vice." PTA + Pynchon (with another soundtrack from Radiohead's Jonny Greenwood) = nerd nirvana!